Beautiful Arabescato marble imported from Italy. This stone looks more beautiful than Carrara marble (Carrera). A stunning fireplace that is hand carved into a classic style with columns. The Barrington is of Old World design that will always be in style. This is what makes this design timeless. A perfect mantel for a living room or library. This will surely be the focal point of any living space. 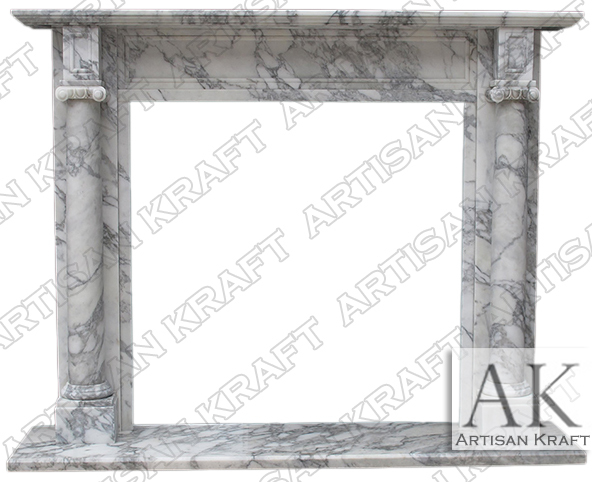 Most marble fireplaces are polished and sealed. If in stock Fireplace is available to ship in 1-3 weeks. Carrara marble (Carrera) looks similar to this because it too has black veining but the Arabesco is still better. Stone: Precast, marble, limestone, sandstone.